‘Free laptops boost computer savvy, not career prospects’ – THE HINDU!! This report validates what we at Novatium have been saying for a while – ‘Throwing computers at schools is not going to make schools better’. Today’s learners have the innate ability to easily navigate and use the internet. The Internet has evolved into a space that encourages participatory culture, allowing students to create, connect, and collaborate with a global audience. With these developments in the past few decades educators have the responsibility to train today’s generation to be responsible and ethical life-long learners of the digital age. Simply, handing out devices to students is not the answer, Educators must demonstrate, guide, and help students actively participate in authentic learning experiences using tools like learning management systems. The Edugrid was designed to deliver transformational educational experiences to learners everywhere, through it’s contextual learning environment students have access to learning anytime. Digital literacy is wanting among young adolescents, especially in villages. With the government having provided laptops to higher secondary school students, its use has increased but the adolescents need to be taught to use it to improve their career path. 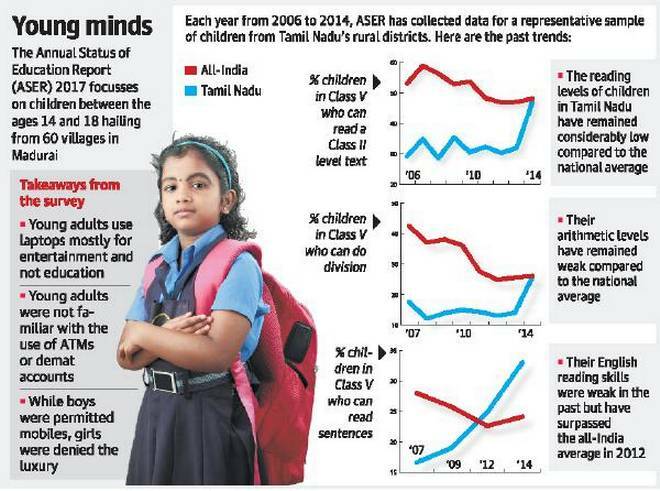 The Annual Status of Education Report (ASER) that studied young adolescents aged 14-18 in the country this year has indicated that youngsters in rural Tamil Nadu had aspirations but were unable to take them forward. While access to laptops was easier owing to State government policy, the young adults used it to watch movies rather than for education. ASER selected 60 villages in Madurai district for the survey, which was done by 40 college students. “We trained the college students or four days. We mapped the district and chose 16 households from each village,” said G. Kumaresan, a member of the regional team at ASER Centre. Madurai was chosen as only the Madurai Kamaraj University responded to ASER’s request for support, he said. As many as 1,000 young adults were surveyed by college students, who talked at length to the participants about their aspirations. “Though students aspired for higher studies and even spoke of wanting to become a Collector or a doctor, when we asked how they would go about it, many said it was enough to pass Class XII,” Mr. Kumaresan said. The youngsters knew how to operate a bank account and knew to withdraw money, but they were not familiar with the use of ATMs or DMAT accounts, the survey revealed. Also, though boys were permitted to have a mobile phone, girls were not given a phone, Mr. Kumaresan added. Though the youngsters could read Tamil they were found wanting in Mathematics. “I went to 10 villages and the boys and girls told me that they would like to travel away from their villages for a job or to study. They showed little interest in reading newspapers but are very much into using laptops,” Mr. Kumaresan added. K. Thirumal, a teacher at a government higher secondary school in Avanipuram in Villupuram district, agreed with the survey observations but said parents had a key role in motivating their children. The government could appoint counsellors in each district who could give career guidance, he added.